Rasam is a South Indian soup. 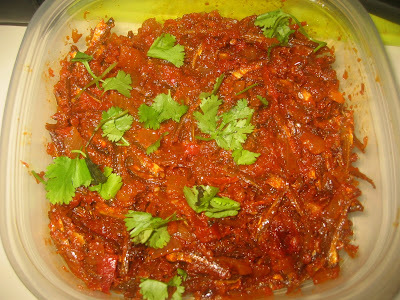 It is prepared with tamarind juice or tomato, pepper and other spices.It is eaten with rice or alone, as a a soup. In a traditional meal, it's kinda of second course, follows the sambar course and is followed by curd rice. It differs from sambar in that it usually relies on tomatoes for its sourness rather than tamarind, and it is usually much more fluid. It makes for a very good appetizer or soup also when taken all by itself. Rasam has many spices and is considered to be good for health. Lentils are also added but I'm not using it for my recipe..I like mine plain.. In a blender add 1/2 of the chopped tomatoes,1/2tsp cumin seeds,1tsp rasam powder,few curry leaves,peppercorns and 1cup of tamarind water.Grind to a paste. Coat a wok with 1tbsp of oil,add the mustard seeds followed by remaining of the cumin seeds,dried chillies,curry leaves.onions and finally the tomatoes.Add the turmeric powder and salt.Saute till the onions and tomatoes comes to translucency. Now add the grind pasted and the remaining tamarind water and rasam powder. Bring to boil and adjust the level of salt. Granish with chopped coriander leaves.